CHINT is the leading player in the Low-voltage electrical and Power Transmission and Distribution industries in China. 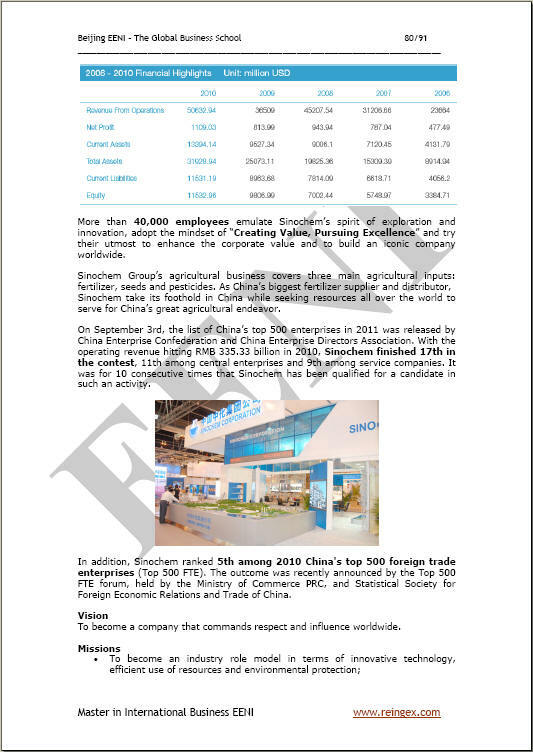 CHINT ranked fifteenth in the list of top 100 companies released by Forbes, which were appraised from all private companies (both listed as public and not) in China. Nine Dragons Paper. Established in 1995, Nine Dragons Paper is the largest container board products manufacturer in China and one of the largest in the World. Nine Dragons Paper primarily produce linerboard, including kraft linerboard, liner test board and white top linerboard, high efficiency corrugating medium, and coated duplex board. Shanghai Silk Group Co., Ltd. Is the largest garment export enterprise in China, having very crucial position in the field of garments export. The Company has accumulated 20 billion dollars for export and ranked first in Shanghai for twelve years. The Company's business has covered eighty countries and regions, and established long-term and steady International Trade Relations with 1,000 customers around the world. The Company enjoys high reputation in the International market. China Mengniu Dairy Company Limited's principal operating affiliated company - Inner Mongolia Mengniu Milk Industry (Group) Co., Ltd. (Mengniu Group), was founded in 1999. In a short period; it has grown into one of the leading dairy companies in China. Mengniu Group produces, markets and distributes dairy products throughout China (including Hong Kong and Macau). The company's different product line includes liquid milk products (comprising UHT milk, yogurt and milk beverages), ice cream and other dairy products (milk powder and milk tablets). Chongqing Lifan Industry (Group) Co., Ltd was created in 1992. It is one of the largest private-owned companies in China. After fifteen years' efforts, Lifan Group has quickly grown up and developed to be a large-scale private enterprise centring on the technology development, manufacture and sales of vehicle and motorcycle, which also invested in the financial sector. Hangzhou Wahaha Group Co, Ltd, the leading beverage manufacturer in China, has totally 36 subsidiary companies covering sixteen provinces or cities. It has 10,000 employees, with a total assets of ￥4.4 billion. The modern plants of the Group have an occupation of the land of 1,800 Mu, with 500,000 building area. It has 60 world-class automatic production lines, whose value is USD 300 million. Thus, it forms the production capacity of 2.5 million tonnes per year with the accessory canning, bottling, and capping lines. Guangzhou Automotive Group Co., Ltd. (“GAC”) was integrally converted into a joint stock company from the former limited liability company on June 28th, 2005. 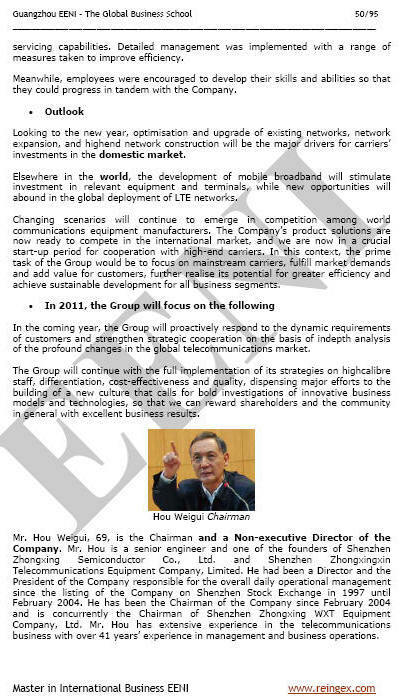 GAG ranked 40th in “China Top 500 companies.” The Group has a total market share of 3.37% in the automotive market. ZTE Corporation is a publicly-listed global telecommunications equipment and network solutions provider operating in 140 countries. ZTE was the only Chinese Information Technology and telecoms manufacturer listed in Business Week Information Technology 100 and was also integrated into Business Week's ranking of China's Top 20 Brands. The company has fifteen Global Research and development centres in the United States, France, Sweden, India, and China. Huawei is a leading global information and communications technology (ICT) solutions provider. Their products and solutions have been deployed in over 140 countries, serving 33% of the World's population. Huawei Holding is solely owned by employees of the Company, without any third parties, including Government bodies, holding any of its shares. 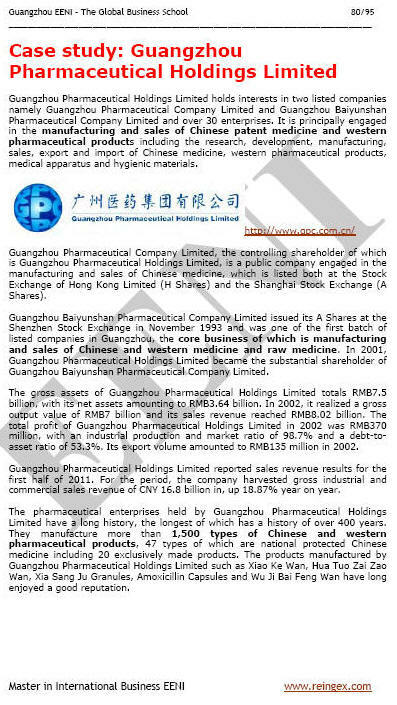 Guangzhou Pharmaceutical Holdings Limited is principally occupied in the manufacturing and sales of Chinese patent medicine and western pharmaceutical products including research, development, manufacturing, sales, export and import of the Chinese medicine, western pharmaceutical products, medical apparatus and hygienic materials. 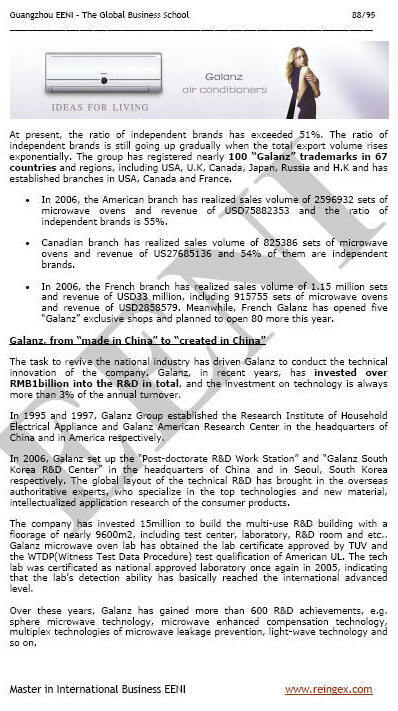 Galanz Group is a world-class enterprise with the target of building “a centennial enterprise and global brand” and has globally leading Research and development microwave oven, air conditioners and household appliances centres in Shunde and Zhongshan, Guangdong. It has thirteen subsidiaries in Headquarters, fifty-two sales offices across China and branches in Hong Kong, Seoul (Korea) and North America. 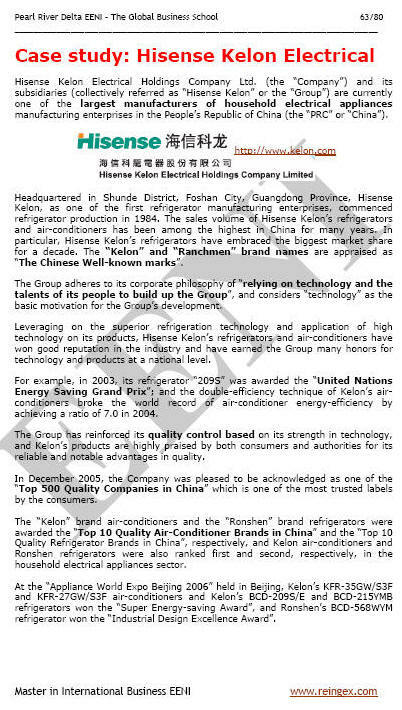 Galanz is the largest air conditioners manufacturer in the World. Galanz´s products are hot sales in 200 countries and regions; the annual sale volume reaches 13 billion RMB, and the profit of foreign exchange is 700 million dollars. As one of the top three automotive corporations in China, Shanghai Automotive Industry Corporation (Group) (“SAIc” for short) is mainly occupied in manufacturing, sales, research and development, foreign direct investment (FDI) in passenger cars, commercial vehicles and components, as well as related services trade and financial business. In 2009, the company also entered the Fortune Global 500 list for its consolidated revenue of USD 24.88 billion, ranking 359. SAIC holds 10% equity shares of GM Daewoo; it has set up branches in the United States, Europe, Hong Kong, Japan, and Korea. SAIC culture, as a Group culture incorporating multiple cultures and connotations, is bound to meet with collision and friction between different cultures. SIEMENS IN SHANGHAI. Over the next two years, Siemens will invest 70 million Euros in building a centre for regional headquarters in Shanghai. The centre will be called Siemens centre Shanghai (SCS) and serve the Eastern region of China. In fiscal 2009, sales to the Chinese customers amounted to EUR5.2 billion. New orders amounted to EUR5.5 billion. Siemens has 43,000 employees in China. The cooperation between Siemens and China started as far back as 1872. The first Siemens order from China was the delivery of pointer telegraphs, marking the beginning of modern telecommunication development in China. The fast growth of business relations with China prompted Siemens to set up its first permanent office in China, in Shanghai, in 1904. This was a major milestone of the company's engagement in China and marked the beginning of Siemens' journey to become the well-liked and respected corporate citizen in China it is today. After decades of successful cooperation, Siemens founded Siemens Ltd. In 1994. With some 13,000 employees, Siemens Shanghai is the largest location outside Germany. 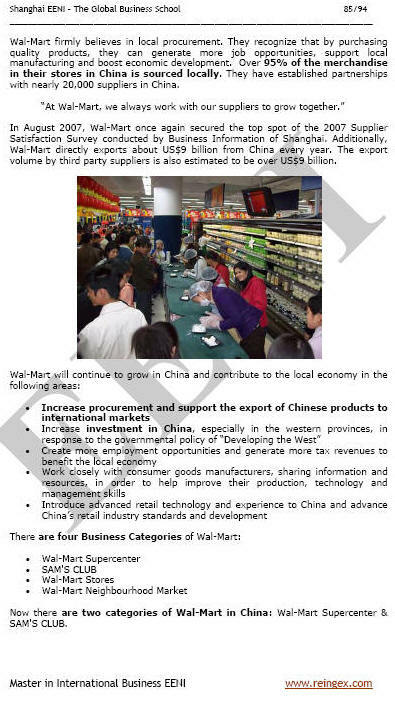 Wal-Mart came to China in 1996. The first Supercenter and SAM'S CLUB were opened in Shenzhen, Guangdong Province. There are 101 units in fifty-three cities, including 96 Supercenters, three SAM'S CLUBs and two Neighbourhood Markets. Across China, Wal-Mart employs 40,000 associates. Wal-Mart firmly believes in local procurement. They recognise that by purchasing quality products; they can generate more job opportunities, support local manufacturing and boost the economic development. Lenovo is a 21 billion dollars personal technology Company serving customers in 160 countries, and the fourth-largest PC vendor in the World. Formed by Lenovo Group's acquisition of the former IBM Personal Computing Division, the company develops, manufactures and markets reliable, high-quality, secure and easy-to-use technology products and services. Lenovo has continued to outperform the worldwide PC market for the past eight consecutive quarters, through strong execution of the successful “Protect and Attack” strategy. Founder Group was invested and created by Peking University in 1986. Over the past 20-odd years, Founder has adhered to sustainable technical innovations and assumed an important position in the development of Information Technology industry process of the People's Republic of China. The total sales revenue of the Group reached 6.5 billion dollars in 2008. 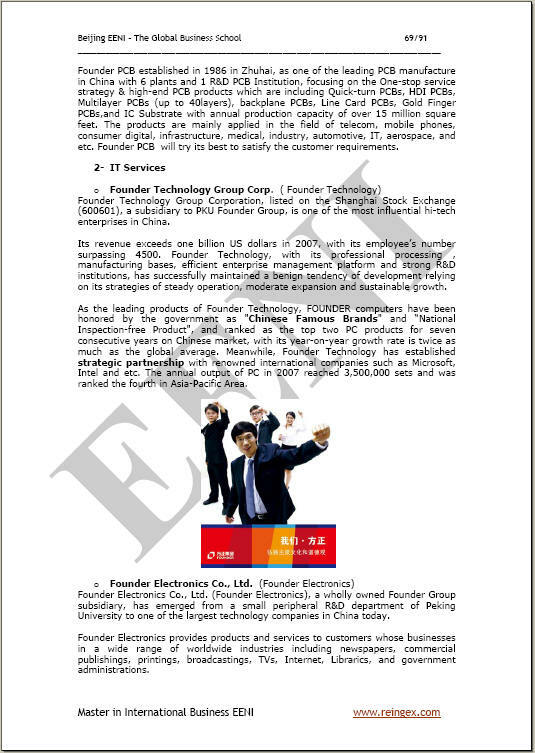 Founder has sustained the second place in PC manufacturing for seven consecutive years, constituting the manufacturing foundation for the development and massive application of the Chinese IT industry. 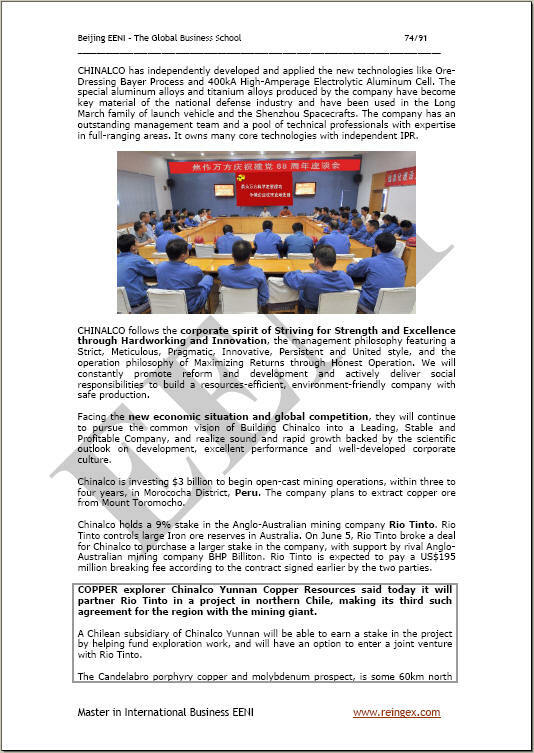 aluminium Corporation of China (CHINALCO), is the second largest alumina manufacturer and the third biggest primary aluminium producer in the World. Based in China and oriented towards a global presence; it aggressively integrates its resources while accelerating the expansion of its international businesses and an immense product portfolio. As one of the key state-owned enterprises under the supervision of SASAC (State-owned Assets Supervision and Administration Commission of the State Council), Sinochem Group has been named to “Fortune Global 500” for twenty-one times, ranking 168th in 2011. Sinochem is China's largest integrated agricultural company. Established in 1981, TCL Corporation employs 50,000 people in eighty operations, including eighteen Research and development centres, twenty manufacturing bases, and forty sales offices around the world. 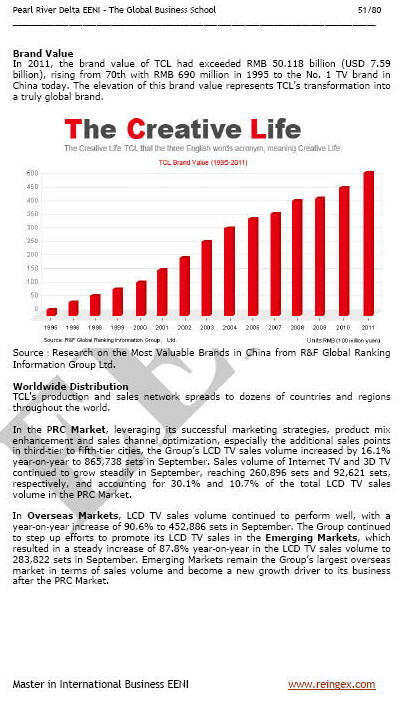 TCL is one of the leading flat panel TVs, DVD players, air conditioners, and GSM, CDMA mobile phones producers in the World. TCL has entered a new stage of development after its historical transformation from a local Chinese company to a multinational. Midea Group has developed into a leading manufacturer and exporter in China, covering an exhaustive line of heating and air-conditioning systems, home appliances, lighting, motors, compressors and other industrial components. Midea is the second largest supplier and the number one in air-conditioners exporter in China. COSCO. 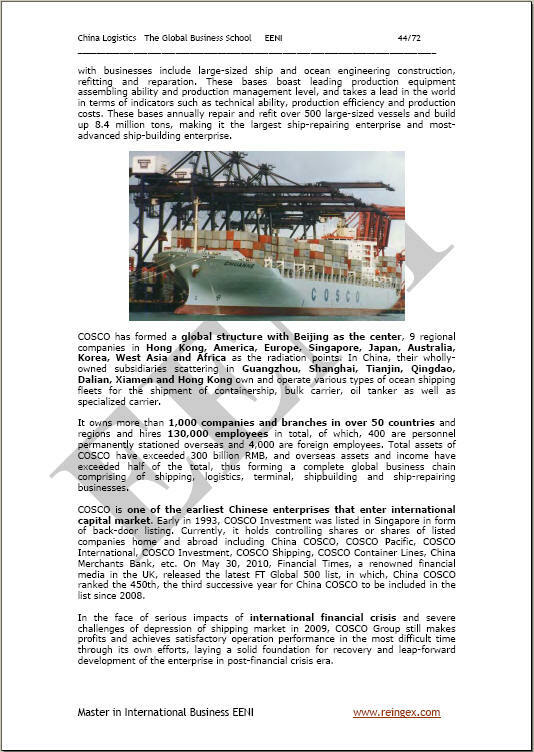 Founded on April 27, 1961 as the pioneer of international shipping carrier in China, together with the reconstruction of national transport resources on February 16, 1993, China Ocean Shipping (Group) Company (COSCO) has grown into a USD 17 billion corporation by clearly focusing on the goal of enabling commerce around the globe. COSCO is an international giant, specialising in shipping and modern logistics, serving as a shipping agency and providing with services in freight forwarding, shipbuilding, ship repairing, terminal operation, international trade, financing, real estate and information technology industry as well with an objective at taking one of the leading roles in these areas. 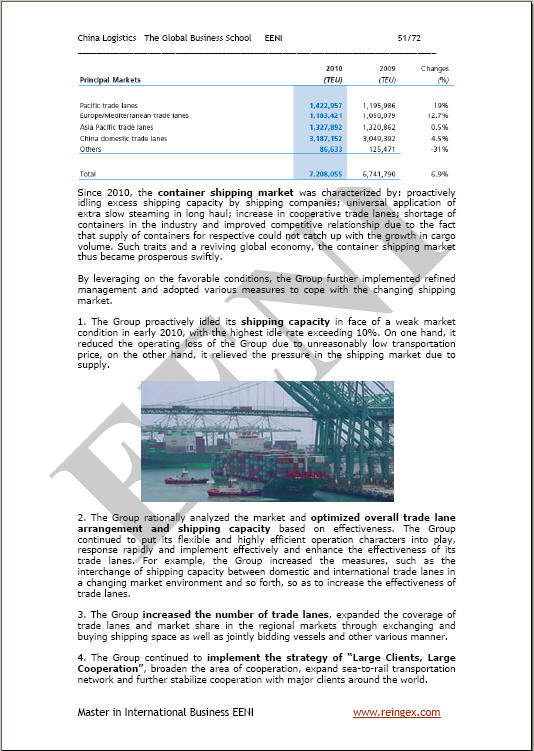 China Shipping Container Lines Company Limited (CSCL) is the fastest growing and world leading largest container shipping company with its headquarters in China. It is principally occupied in the operation and management of international as well as national trade lanes. 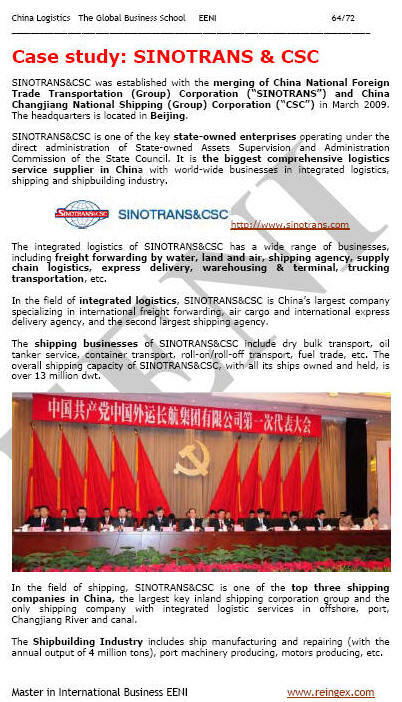 Sinotrans Ltd operates logistics as a major business, with an integration of ocean transport, land transport, airfreight, warehousing and terminals, express services, shipping agency and freight forwarding. In 2003 and 2004, Sinotrans consecutively held number one in the top 100 International Forwarders, and 2003 won the Best Asia IPO prize.